FREE BEACH SERVICE!! MAY 11-17 ON SALE! 93 "5 STAR" REVIEWS! ** never before offered until 2019!! FREE daily beach service (March - Nov 1st) 2 chairs, 1 umbrella' plus your choice of a stand-up Paddleboard or sea Kayak for one hour daily. Our beautifully appointed and professionally decorated ocean front condo has been described as JUST PERFECT over and over again. A local real estate professional branded us as a "platinum property" - the highest rank. Recently freshly painted, plus LOTS of upgrades including a 50" TV . Read our reviews to get an accurate feel of my guests experience - we'd love to help you build your family memories. This Summerwind Resort unit has proven to be one of the most popular, and well rented condos available on this beautiful beach. We would love the opportunity to host your perfect vacation. This three bedroom, three bathroom unit (sleeps 10!) on the fifth floor looks directly onto the blue-green waters of the Gulf of Mexico from a large wrap-around balcony. The master bedroom has a comfy king-size bed and overlooks the Gulf. Light blocking drapes ensure your sweet dreams! The second bedroom has a queen-size bed, and the third bedroom has 2 full-size beds. We are also able to offer a queen sized pull-out sofa/bed in the living area. We comfortably sleep 8-10!! Each bedroom has private access to a full bathroom. Also - there are flat screen TVs with DVDs in all the bedrooms. Enjoy the gourmet kitchen complete with upgrades, such as granite countertops and fully stocked with anything you would need to dine within.. There are restaurants & very fun bars within walking distance if you want to eat out. Summerwind is THE BEST location on the island! Our beach home is fully furnished with everything you need to relax and enjoy the surf, the sun and the sunsets. From the upgraded decor to granite counter tops, to new widescreen TVs, this condo has it all. The view from the balcony is perfect, with additional seating for all your guests to toast the sunset. 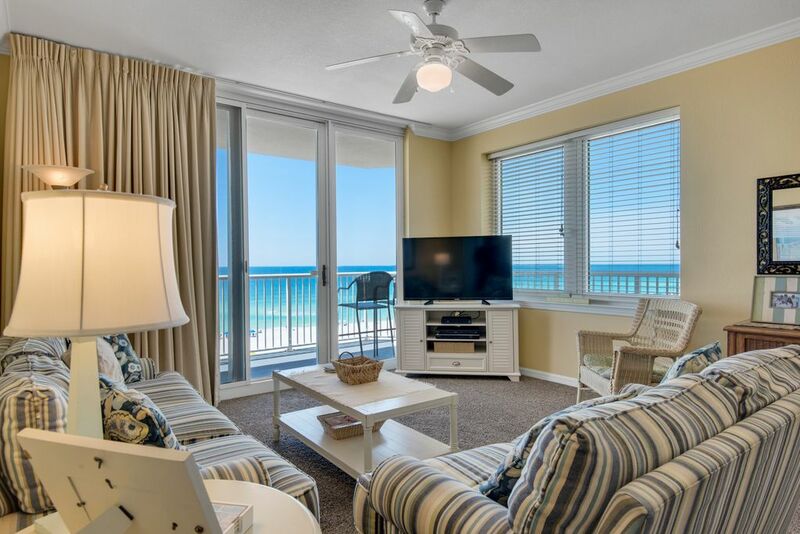 The Summerwind Resort is located on the serene and beautiful Navarre Beach, where many have enjoyed its pristine, sugar-sand beaches and aquamarine ocean. Our Resort boasts the best amenities on the island: 3 sparkling pools, 3 hot tubs, huge expanded sunning areas and a boardwalk leading to the beach. You can enjoy the beauty of the beach while you exercise in the resort's 3 fitness centers which each overlook the Gulf. This unit is available to renters at least 25 years old, and this a NO SMOKING and NO PET home. The resort does not allow guests to bring their pets. We are 2 families, close friends who vacationed at Navarre Beach for spring break in 2003 and came away with the ultimate souvenir......a contract on a condo! We visit several times a year, constantly upgrading and re-stocking our units. We know you have a choice in where you vacation and we take pride in making your experience a truly wonderful one. We say 'Thank you' to all the people we have hosted and to your many return visits and referrals. Wow - where to begin.....as stated above, we loved Navarre Beach so incredibly much that we put a contract down on our unit before we left. This is no ordinary beach - it is pristine, beautiful and peaceful. We are 'beach people' having vacationed all our lives up and down the east coast and panhandle. To us, Navarre Beach is incomparable for it's beauty and laid-back vibe. Our unit has been described over and over again as 'even better than your pictures.' We recently purchased brand new comforters, kitchen supplies and tables. Since our condo comfortably sleeps 8-10 (max capacity) we have been able to host larger family gatherings. Above all, it is inspected weekly by our housekeeping team and cleaned to strict standards. Perfect view from the 5th floor wrap around balcony - not too high, not too low. Just perfect! Clean sheets and clean towels will welcome you upon check in. Just bring beach towels! Each Summerwind tower boasts its own fitness room overlooking the ocean! Huge collection of hardback and paperback books for our guests to enjoy! Huge collection of games for our guests to enjoy! Huge collection of movies for our guests to enjoy! DVD players, Full Gourmet Kitchen with new granite countertops, Refrigerator w/Ice Maker, Bed & Bath Linens provided. Brand new - 50" flatscreen TV in the living area! Very nice condo everyone had a great time and loved the beach and the area! This was my first time in Navarre Beach. We will be back and stay at summer winds again. The unit and property was perfect and the staff was very friendly & helpful. What a special place! Just thrilled with our vacation! We rented this beautiful condo after our neighbors raved and raved about both this Summerwind unit and Navarre Beach. We are so glad to now "be in the know" about this gem as we will definitely be returning. Just a great experience from the minute we booked down to the last morning watching dolphins from our balcony. The condo was very clean and decorated in such a pretty, coastal way (and the beds are very comfortable!) My grandkids loved the beach toys, along with all the DVDs and games the owner provided. The complimentary beach service was a huge plus for us as we didn't have to lug down extra chairs. All in all, we were sad to leave and can't wait to return. Lynn, you were so helpful answering all our questions and sending us so many great restaurant suggestions AND checking in on us during our stay. Thank you!! We can't wait to return next spring. We are so happy we listened to our friends :) from Martha B. Five star rating and we look forward to staying again!! Five ladies just stayed at this unit and it was super! Well laid out and totally stocked with household items. Location right next to the pier and within walking distance to restaurants. Water and beach were the prettiest I have seen ... and I have been going to different beaches for years! Highly recommend staying here. ** 16.5% TAX REPRESENTS 12% BED TAX + 4.5% ADMIN FEE, $ 129 CLEANING FEE AND $40 INSURANCE WAIVER FEE. This is a NON SMOKING, NO PETS ALLOWED condo. Monthly rentals available for the months of December, January, and February only.